Space shuttle Atlantis backs out of Orbiter Processing Facility-1 (OPF-1) at NASA's Kennedy Space Center in Florida in 2011. The building will now be used by Boeing to service the U.S. Air Force’s X-37B space plane. A former NASA space shuttle hangar will serve as the new home and servicing facility for a fleet of secretive military space planes. The Boeing Company announced on Friday (Jan. 3) it will begin converting Orbiter Processing Facility-1 (OPF-1) at NASA's Kennedy Space Center in Florida to support the U.S. Air Force X-37B Orbital Test Vehicle (OTV). Built by Boeing's Phantom Works, the winged X-37B space plane resembles in some ways a smaller version of NASA's shuttle with a 15-foot (4.5 m.) wingspan. No other details were released, other than Boeing noting the project will expand its presence in Florida by "adding technology, engineering and support jobs at the Kennedy Space Center." 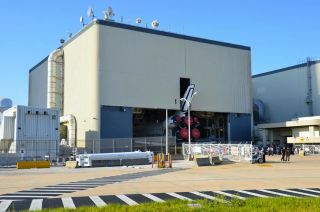 One of three similar hangars to previously house NASA's orbiters, OPF-1 has been vacant since June 2012, when the space agency's final shuttle to fly into space, Atlantis, departed the building. Built in the late 1970s, OPF-1 has a 29,000-square-foot (2,700 sq.m.) high bay and stands 95 feet (29 m.) tall. The hangar is the second NASA OPF to be commercially leased under an agreement with Space Florida, the state's spaceport authority and aerospace development agency. In October 2011, Boeing also took over use of OPF-3 to support its CST-100 spacecraft, a crewed capsule being developed to potentially fly NASA astronauts to and from the International Space Station. That facility, now referred to as the Commercial Crew and Cargo Processing Facility, or C3PF, is nearing the end of its conversion to begin manufacturing and testing the five-seat, gumdrop-shaped spacecraft. "This project has been a great example of state and local agencies working together to create an optimal toolbox of capabilities for the customer," Frank DiBello, president of Space Florida, said in a statement released by Boeing. "The commercialization of OPF-1 through Space Florida's project funding was a critical factor in attracting Boeing to Florida." The U.S. Air Force Rapid Capabilities Office has launched three X-37B missions for unknown purposes since April 2010. The third flight, which marked the first reuse of the two-vehicle fleet's first spacecraft, is still orbiting the Earth more than a year after its launch atop an Atlas V rocket from the Cape Canaveral Air Force Station in Florida. What the space plane has done during its time in space remains largely a mystery. Though speculation has ranged from testing new sensor technologies to reconnaissance, the details of the X-37B's mission, including its payloads and objectives, have been kept classified. The previous two OTV missions landed and were serviced for flight at Vandenberg Air Force Base in California. The U.S. Air Force has hinted that OTV-3 may touch down in Florida, perhaps landing at the Shuttle Landing Facility at the Kennedy Space Center. Space Florida is currently in negotiations with NASA to take over use of the 3-mile (4.8 km) runway. Although currently dedicated to flying secret missions for the military, the X-37 space plane could be evolved into a vehicle capable of flying supplies, or even astronauts, to the space station, Boeing officials have earlier said. First proposed in 2011, the X-37C would be a scaled up version of the X-37B, which has a payload bay about the size of a pickup truck's bed. The U.S. Air Force OTV program was built upon work first done by NASA and then the Defense Advanced Research Projects Agency (DARPA). The X-37B spacecraft was originally intended to be deployed from the shuttle's cargo bay, but following the loss of the orbiter Columbia in 2003, it moved to Delta and then Atlas rockets.